SF Taxi Media: San Francisco Taxi Drivers Are At A Crossroads. Here's a message... Stand Up For Yourselves Or Eat It! By John Han. San Francisco Taxi Drivers Are At A Crossroads. Here's a message... Stand Up For Yourselves Or Eat It! By John Han. 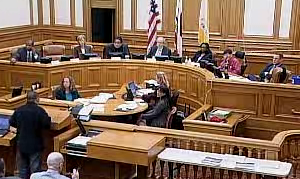 Sonali Bose, chief financial officer for the San Francisco Municipal Transportation Agency (SFMTAS), has said that the City should, "move on", from the controversy over 5% credit card fees, electronic waybills, and rear seat payment terminals. She was quoted at the end of a Bay Citizen article published Saturday entitled, "Taxi's Credit Card Machine "Broken"? Likely story", by Zoe Corneli. Credit card fees are here to stay, according to that article. The MTA isn't budging but is committed to making the 5% fees stick on the taxi drivers, because keeping the fees would put San Francisco "in line with Boston, Chicago, New York, and Philadelphia." The MTA seems to be saying that whatever protests its actions could trigger from the cab drivers, even if it were to be a strike, it knows it has the six-figure salary's worth of people and resources to hunker down, so to speak, like weathering a storm, and wait for the taxi drivers to exhaust themselves and give up. For them, it would be easy. The City is saying that eventually the commotion will settle down and taxi drivers will have to go back to work. Then they will begrudgingly, but quietly, accept the new terms of the 5% credit card fees, electronic waybills, and rear seat payment terminals. Just give it time, they'll get used to it. If all that were to be the case, then everything, including the protests, will have just been a hiccup... a minor bump in the road... and the City could, "move on", doing it's other transportation policies, hopefully with nary a hitch. It is now up to the San Francisco taxi drivers to tell the City of San Francisco in the coming weeks or months whether they, as workers, agree with those terms or not. Should drivers just be quiet now and take the fees, electronic waybills, and rear seat PIMs? If they do then they will end up like the New York cab drivers. Or should they continue to protest until the administrators grow weary? The ball is in their court. The SFMTA's Memorandum On A Meter Rate Increase.